If you’ve ever wondered whether you’re a glass half-full or a glass half-empty kind of movie-goer, Into the Wild will give you the answer. Sean Penn’s fourth directorial effort is filled with wrong-headed choices that seriously detract from the experience of the film. It’s easily and justly picked apart. But, it’s also ambitious, compelling, and will leave glass half-full types (like me) more than contented. After graduating from Emory University in 1990, white, middle class Chris McCandless emptied his savings account of its $24,000 intended for law school and donated the money to OXFAM. He then disappeared from family and most of his friends, took to the road, and headed West. Inspired by nature-loving iconoclasts like Henry David Thoreau, he made lovely connections to people he met, pushed his body to its limits, nurtured his spirituality, and in a little over two years died in the Alaskan wilderness. In 1996, John Krakauer, the rightly famed author of mountaineering tales, told Chris’ story in the best selling biography, Into the Wild, adapted for the screen by Sean Penn. The story seems a natural one for Penn. His three previously directed films- Indian Runner, Crossing Guard, and The Pledge– are set in small towns, and some of the best scenes here involve Chris’ interactions with odd-ball Americana types on the margins of mainstream society. As in his previous films, the acting is exceptionally good. Penn is notorious for giving his actors free rein to create and interpret their characters and to improvise during rehearsals. Except for William Hurt’s overly mannered work, the performances are outstanding. Marcia Gay Harden, Jenna Malone, Catherine Keener, Vince Vaughn, and Hal Holbrook are at the top of their game. But the film ultimately depends on Emile Hirsch as Chris. Certainly his solid work in Lords of Dogtown and especially Alpha Dog was encouraging, but none of that prepared us for this performance. At the center of almost every scene, the film cannot work unless we believe every moment of Hirsch as Chris. And we do. Each attractive and aggravating nuance of Chris’ character is perfectly rendered. It’s a career-making performance. But what makes this Penn’s most ambitious and satisfying film is the richness of its interpretive approach. 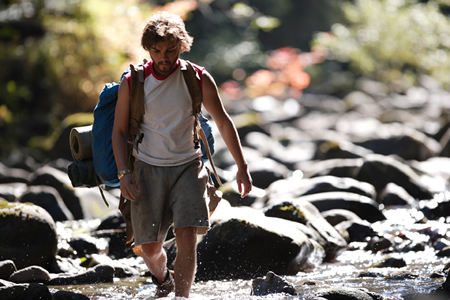 Quite remarkably, Into the Wild sustains three analytical frameworks for coming to terms with Chris. For those of us who want a psychological interpretation, his odd and dysfunctional family is rendered as complex and debilitating. For those of us who want a more political interpretation, we see Chris’ deep and genuine revulsion with the shallow and deadening materialism, competition and vanity that besets modern America. And for those of us who want to see Chris as the quintessential American hero, he is clearly channeling James Fenimore Cooper’s Deerslayer, Mark Twain’s Huck Finn, and, above all, the sainted Thoreau. I can’t remember a film since Lawrence of Arabia that manages so successfully to articulate and juggle so many interpretive schemes without privileging any of them. The stories of Lawrence and McCandless require that we see them whole and through a host of filters, and for managing that Penn deserves very high marks indeed. Alas this glass is also half empty, and many things prevent Into the Wild from becoming the remarkably good film that it should have been. The interesting score is ham-fistedly blasted at the audience to punctuate the story, and it simply takes us out of the flow of the movie. In the last half hour, almost every major character is given their moment to cry, and the effect is treacly. Long after we realize that certain characters have become surrogate parents to Chris, or he a surrogate child to them, this is baldly announced in case any of us missed the point. Not content with showing us Chris’ spiritual journey, the film suggests that he’s a kind of Jesus figure, who brings emotional well-being to everyone he touches. Most disastrously, the interesting structure of the film goes terribly awry in the last half hour. The bulk of the movie cuts effectively between flashbacks from Chris’ childhood and his early adventures on the road, and then returns us to his current, increasingly desperate situation in Alaska. But as the stakes get more serious and death looms, we don’t welcome being jerked out of that Alaskan present tense. Penn does a wonderful job of building a foreboding sense of doom and then beautifully moving it to the edge of catastrophe. But then in the last half hour, he vitiates that good work with too many and too lengthy, intensity-sapping flash-backs. The final epiphany of Chris is mawkish. And most everyone will feel that the film, with a running time of 140 minutes, is a half hour too long. After Chris’ death he became an iconic and controversial character. Some lionized him as embodying the American spirit of "lighting out for the territories," being true to oneself, forsaking creature comforts for intimacy with nature and the ineffable, and living life without compromise. A smaller band of naturalists criticized him as a reckless amateur who willfully placed himself at risk, died an unnecessary death, and who should be seen as a cautionary tale for those who would emulate his life in the wilds. Sean Penn never enters this debate, though his heart and sympathies lie with Chris. But his film can be seen as giving credence to a variety of readings of Chris’ life and its meaning. For bringing us a vivid, complicated, compelling young man and his mythic journey, we can be thankful for Emile Hirsch’s remarkable performance in Sean Penn’s at least half-full glass.